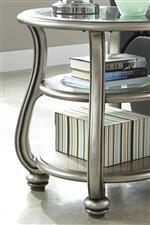 This oval cocktail table features curved legs that sit atop turned feet for an elegant silhouette. The metallic silver finish offers glamorous style, while the tempered glass table top insert and middle shelf insert keep the table's look light and airy. An additional shelf at the base of the table adds to your living room storage options. The Coralayne Oval Cocktail Table in Silver Finish with Glass Top by Signature Design by Ashley at Beck's Furniture in the Sacramento, Rancho Cordova, Roseville, California area. Product availability may vary. Contact us for the most current availability on this product. The Coralayne collection is a great option if you are looking for Glam Transitional furniture in the Sacramento, Rancho Cordova, Roseville, California area. Browse other items in the Coralayne collection from Beck's Furniture in the Sacramento, Rancho Cordova, Roseville, California area.